“So, er, what’s a zine?” The question I hear from friends when they’re informed that I make zines. They’re right to ask—what is this strange thing that I produce? To get the tedious basics out of the way, the word ‘zine’ comes from the end of ‘magazine’, hence why it’s pronounced ‘zeen’ (NOT ‘zyne’!). So they are, in effect, mini magazines. Except that they’re not as glossy or ‘professional’ as magazines. They are rough and ready, handmade, do-it-yourself, simple paper zines. They are inherently anti-professional and pro-mistakes; unedited documentations of human experiences and opinions which, in my view, have the purpose of finding like-minded others to share relevant information in various formats. Though self-published pamphlets can be traced as far back as the 18th century, the tangible concept of a zine didn’t exist until the science fiction cult of the mid-twentieth century. It wasn’t long before the 1970s hit and zines saw an explosion in punk music and culture. Zines of course sat perfectly with punk’s anti-authority, do-it-yourself, take-power-into-your-own-hands ethos, and remain an integral part of punk’s underground to this day, which is what led to my personal discovery of zines. My first exposure to zines was finding them at Cardiff record shops, particularly the tiny, now-defunct Ghost Town Records. I honestly didn’t really get them at first. I would peer at them next to the counter whilst paying for Black Flag or X-ray Spex records or whatever else and think “what’s the point in them when you can use the internet to read about music?” Though they were cheap, I was normally too confused and somewhat intimidated by them to buy one. But I could tell that they were important. It wasn’t until my living in Manchester that I understood and appreciated zine culture as a whole. This is partly thanks to the university’s Other Sounds society once providing links to Salford Zine Library (in Nexus Art Café) and Manchester LGBT zine library (next to Sidney Street café) via one of their Facebook events. I checked out these places and experienced the world of zines beyond punk. There were zines on everything. Anything you can imagine being important to someone, there was a zine on it, from frivolous zines about cats to heavy intellectual zines on globalisation. Flicking through them, they seemed so unabashed, so unedited, so unconventional, so raw. A lot of zines were on topics you could never picture in mainstream and/or conventional media outlets, hence why a lot of them are from ‘marginalised’ voices. There are zine distros, zine fests and other entites involved in this massive hidden culture. This coincided with a Ghost Town Records employee asking me to contribute to a zine he was making. I quickly wrote one piece but then realised I had enough to say to make a zine of my own. But one problem: I didn’t know how to make one. So we ended up making our zines together, him essentially showing me how to put one together. In reality, you don’t need anyone to show you, there are YouTube videos and blogs aplenty on how to make zines. In the stage of finalising the zines, I became paranoid about people reading my zine, to which he said “remember, it’s not going to be marked”. This was a telling statement. As university students, we are painfully used to being assessed on most things we put to paper. The education system and academic life wires us to think all of our greatest thoughts and ideas should be marked, graded, and awarded, even on the creative side of things. When actually, you could just shove them in a zine. Why not? Sod establishment standards! The idea of ‘self-publishing’ can be a difficult concept to get your head around – it definitely took me a while. But actually, there’s probably a lot of things you’re already ‘doing yourself’ without realising. I might have learnt this through punk’s DIY ethos, but that ethos exists in most other subcultures, genres, ‘scenes’, and many other non-musical creative and political endeavours. The tools of self-empowerment can be gained in all sorts of places. Moreover, the total freedom in zine-making is blissful. When writing for conventional and/or mainstream outlets, it can be somewhat irksome to have your writing go through a screening process and edited. Not that editors are inherently bad (probably), they just do their job, which they’re normally great at, and can end up improving parts of one’s writing. But at the same time, one reason zine-making is so cherished and self-empowering is because nothing will be edited by anyone but its creator. Not one sentence, word or syllable. No word limit or anything. Likewise, once something’s published in a more mainstream outlet, the writer doesn’t have much control over who sees it. Though that’s often the point, wanting to reach as many people as possible. But with zines, it can be more powerful to be selective about who’s looking at what you’ve created. This is why zines tend to have highly personal stories and experiences from their authors. 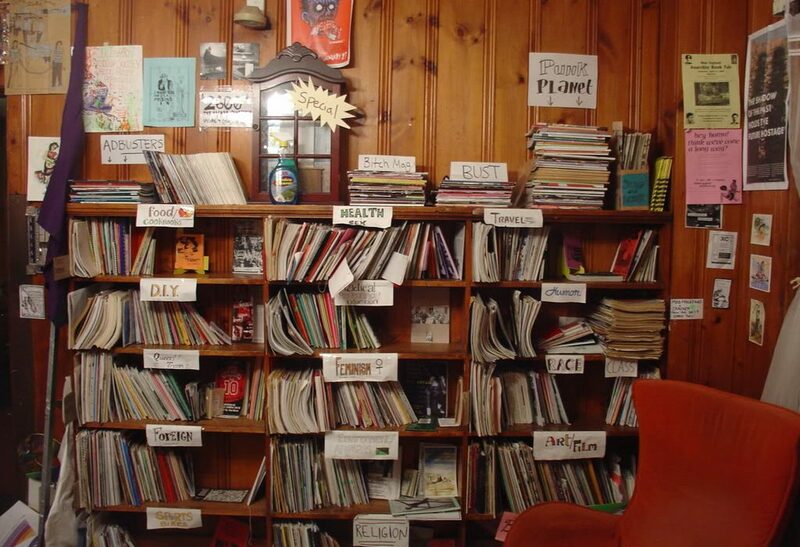 The nature of zine distribution means it allows zinesters to be protective over their zines and more likely to directly reach the intended type of reader. This isn’t an over-romanticization of zines—like any creative endeavour, it comes with its costs. Spending money on things like marker pens, an extended stapler, a scalpel, a cutting board, too many pritt sticks to count, and of course, printing costs (pro tip: U-Print, the print shop, does 1p printing on Wednesdays) become necessary. But most of these are found in cheap stationary and art shops (again, the ‘quality’ of the zine is irrelevant). Yes, it involves money, but the results are so rewarding. There’s nothing like selling a zine at a local gig, say, and someone reading it whilst standing in front of you, wanting to discuss what you’ve written. Or when someone compliments the layout of an interview you did with a band. The aim, though perhaps slightly ironic, in writing this feature for a conventional media outlet like The Mancunion is to say: you can take power into your own hands. The self-published printed word is very much alive. Madeleine’s zine is called Chisel Tip, and you can find more information on it here.